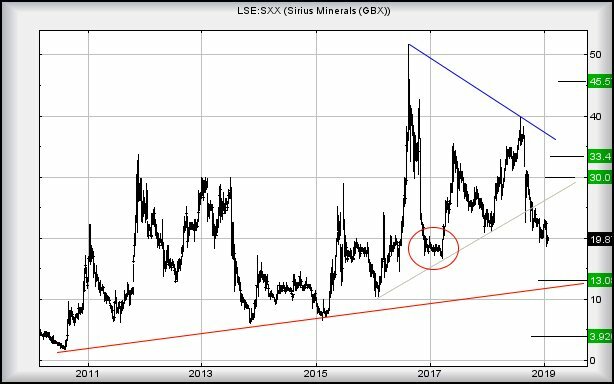 Sirius Minerals #Brent #Dax This popular share is experiencing price flips and flops which make little sense. Needless to say, we’re going to attempt to add some logic to the price swings as surely, post-Brexit, the UK is going to need all the fertilizer it can get? The immediate position is a bit worrying as movement continuing below 18.5p looks like entering a cycle to 13p, a level where some sort of bounce is hoped for. Our secondary, should the share find a reason to close below 13p, now calculates down at an absurd looking 3.9p. For a while, we were pretty convinced this was going to experience a severe drop but now, we’re less confident with the notion. Essentially, when a share ticks every box for a drop yet the market appears to artificially sustain a price, we’ve no choice but to wonder what’s really planned. We suspect, in the absence of negative news, it shall not achieve the 13p level but instead, develop some sort of fascination around the 17p point, if only due to the strange series of price movements (circled) at this point a year ago. Alas, any bounce requires better 27p before it can be taken seriously, allowing an initial 30p but realistically, our secondary of 33p is liable to make its presence felt eventually. Only with closure above 33p shall we believe a longer term 45p to become viable.